Big Bang: You can hear the afterglow hiss on Robert Wilson’s cellphone. And there’s a scientist who carries it around on his cellphone. The Bell Labs horn antenna that allowed Wilson and Arno Penzias to discover the afterglow of the Big Bang. Robert Wilson and Arno Penzias accidentally discovered the afterglow of the Big Bang in 1964. 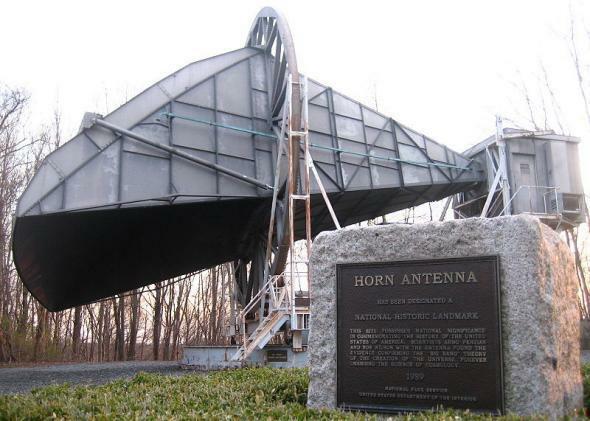 Their now-famous horn antenna, built for Bell Labs in New Jersey, was supposed to be picking up the radio waves emitted by galaxy clusters and supernova remnants. But it recorded a temperature that was 3.5 kelvin hotter than it should have been, no matter where they pointed it. We now know this was caused by the first photons to be released after the Big Bang, which still pervade the cosmos as radio waves. These days, Wilson keeps a sound recording of those waves on his cellphone, as New Scientist discovered when we interviewed with him last week at a celebration marking half a century since the discovery. Lisa Grossman: What was your view of the history of the universe before your discovery? Robert Wilson: As a graduate student, my one cosmology course was taught by Sir Fred Hoyle, a British astronomer who was a proponent of the Big Bang’s biggest competitor, the steady state theory of the universe. Philosophically, I really liked the steady state theory, with no beginning and no end. LG: How did it feel when you first found what later turned out to be the Big Bang’s afterglow? RW: It was a big disappointment. The antenna was hotter than it should have been by 3.5 degrees. We spent nine months improving, checking, calibrating, but that 3.5-degree difference was always the same everywhere we looked. LG: You converted the radio waves your antenna detected into sound waves to help you analyze the data. What does the Big Bang’s afterglow sound like? RW: (Takes out his phone and hits “play.”) This is what it sounded like at the time, though this recording was taken later. About 10 percent of that noise is from the cosmic microwave background. The rest of it is system noise, unfortunately, but that’s the best we could do. Mostly we only listened to it to see if there was radar or something going on—we were not really listening to it. LG: There’s a famous story about pigeons roosting in the antenna. You worried that their droppings could be causing the noise. What happened to the pigeons? RW: We trapped the pigeons and mailed them to a pigeon enthusiast in New Jersey, but he released them and two days later they were back. So in the interest of science, our technician came in with a shotgun, and that was the end of the pigeons. RW: Yes, well, there are lots of pigeons in the world. They aren’t endangered. LG: What did it feel like when you finally realized what you had discovered? RW: Arno and I were happy to have any explanation at all, but we didn’t take the cosmology explanation seriously at first. LG: When did you realize how important it was? RW: There was no “Aha!” moment. How big a deal it was only became clear after many years. I don’t think anyone had a concept of how much information was going to be available from it at that time. LG: At that time, the U.S. was willing to spend money on basic research, partly thanks to Sputnik. Have things changed? RW: I see less tendency of the nation to want to support fundamental science. And I think the country should realize that some of the amazing position we’re in now is because of basic research that’s been done here that doesn’t pay off in the first six months, the first year, maybe even the first decade, but eventually it pays off. And I would like to see that continue.